About 25 legislators of the Karnataka Assembly have submitted a memorandum to the Speaker appealing that the state double their salaries. The legislators are demanding close to Rs.1 lakh per month as salary and allowances. Currently the Karnataka legislators draw a monthly fixed salary of Rs 65,000, in addition to other allowances. 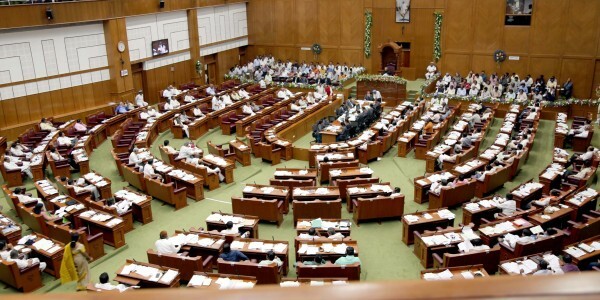 Legislators enjoy fringe benefits like a constituency traveling allowance of Rs 25,000 per month, daily allowance of Rs 1,000 per day for attending any meeting within the state, and Rs 1,500 for meetings outside the state. They are also entitled to a traveling allowance of Rs 20 per km irrespective of mode of journey or fixed traveling allowance of Rs 1,500 for attending each such meeting in lieu of traveling allowance calculated on the basis of distance traveled in kms. it’s unfortunate that these bloody politicians are looting system and hard earned money of common man.why do they deserve royal hospitality a illiterate corrupt criminal politicians. one term MLA MP takes monthly pension of more than 25000Rs/month that too with all other benefits ultimately tax free where as govt employee works 35yrs saves from his own pocket to NPS and gets pension after retirement. senior citizen pension is mere 200Rs/month it’s such shameful to be part the largest democratic country, politicians make mockery of system none of them elected representative wants to work honestly loot as much as possible in 5yrs.